Strategic Coin offers thought leaders an opportunity to get recognized for their views and expertise in this game changing marketplace. Jesus Rodriguez is a prolific blogger and angel investor focused on the intersection of AI and blockchain technologies. Today’s article complements another article we recently published about the taxonomy of cryptoassets. If you think security tokens are a small ecosystem think again. The space may be small compared the generate crypto-asset market but its certain growing at a very rapid pace and its becoming very difficult to keep up with it. Every week, I receive requests to review 2–3 projects in the security token space and I find that most of them have intellectual merits and proper technical rigor. The intrinsic complexity of security tokens is translating into a very large and complex ecosystem. Think about it, to create a utility token you don’t need much more than understand ERC-20 and a handful of other crypto-protocols. In the security token space, any token has to interact with many more building blocks including issuer platforms, liquidity providers, regulatory models, etc. The other aspect that makes the security token ecosystem so complex is its resemblance of the public equities markets. 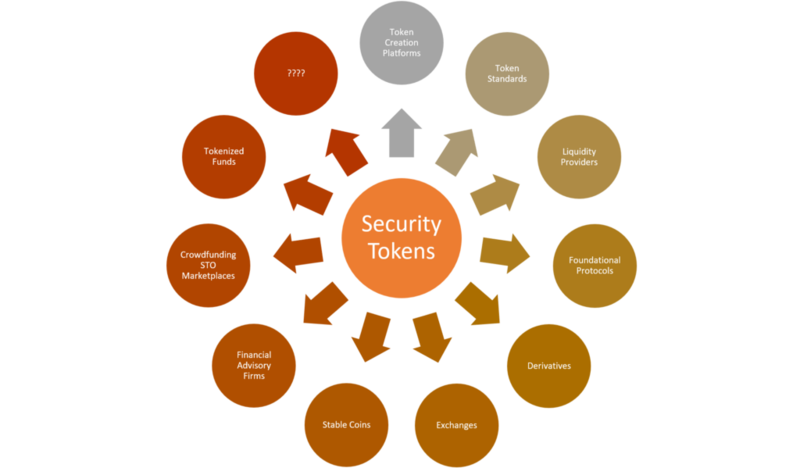 The fact that security tokens behave similarly to well-established financial artifacts such as stocks, bonds or options makes the architecture of many products in financial markets applicable in the security token space. Not surprisingly, we have seen an explosion of new crypto-protocols that are trying to borrow ideas from financial instruments such as derivatives, insurance models, index funds and apply them to the security token space. The end result is that we have a nascent but already very crowded ecosystem in which is becoming difficult to distinguish signal from noise. In order to navigate the growing complexity of the security token ecosystem I decided to create an initial version of a market taxonomy. Today, we will discuss some of the main categories included in the taxonomy and, in the second part of this article we will focus on the individual products. The idea behind this market taxonomy is to highlight some of the main building blocks that are becoming foundational to the security token ecosystem. By no means this is an attempt to provide an exhaustive list of the players in the space. Based on the architecture of the security tokens market, I believe the following categories are becoming relevant standalone segments. Asset Tokenization Platforms: This category groups the technologies that enable the creation and issuance of security tokens. Liquidity Providers: This group includes platforms that are enabling liquidity for security tokens. Exchanges: This category lists the first wave of crypto exchanges that are supporting security tokens. Foundational Protocols: Maybe we need a better name for this group 😉 but is a generic category that includes protocols that are common across many security token products. Derivatives: This group includes the nascent area of crypto-derivatives protocols that are likely to have an impact in the security tokens market. Stable Coins: This segment lists some of the main stable coins in the market. Tokenized Funds: This group includes the first generation of tokenized venture funds relying on security tokens . Crowdfunding STO Marketplaces: This group includes platforms that are facilitating security token offerings (STO) for private companies. Advisory Firms: There is no lack of advisory firms that are getting into the security token space. 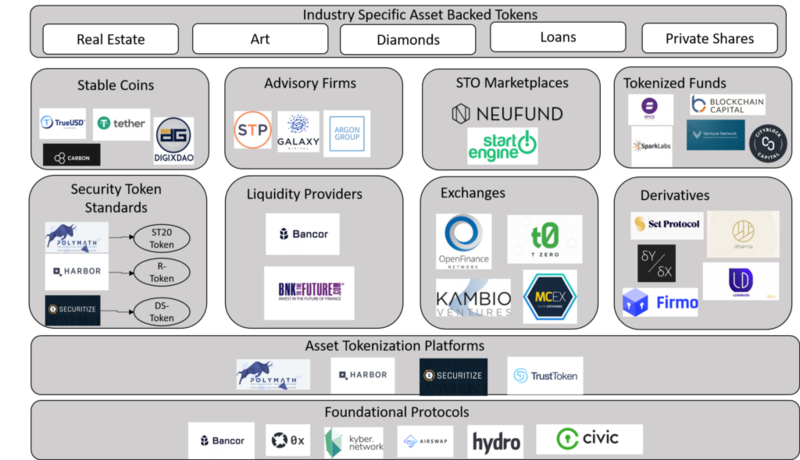 Industry Specific Asset-Backed Tokens: This is a generic group to list vertical categories that are becoming important in the security token market.